Century Concepts International Rare Limited Edition WWII U. 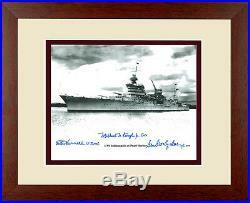 Navy USS Indianapolis CA-35 Portland Class Heavy Cruiser Framed Matted Photo Personally Signed By Three (3) Survivors Item #CC1162. Own a piece of history. Century Concept brings you hard-to-find military, aviation, and historical collectibles and gifts. Wood frame under glass measures 12" x 15" & 8" x 10" photo. 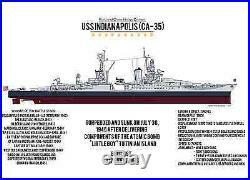 The item "USS Indianapolis CA-35 US Navy Ship WWII Framed Photo Signed By 3 Survivors Coa" is in sale since Friday, August 31, 2018. This item is in the category "Collectibles\Autographs\Military". The seller is "bordi20" and is located in Jim Thorpe, Pennsylvania. This item can be shipped worldwide.